Find the answers to most of the questions you may have regarding service dog certification, ESA registration, and how our process works right here. Simply click on any question below to view the details. If you don't find the answer here, click here to connect with one of our service dog and ESA experts. We'll be able to answer every service dog certification or ESA registration question you may have! 1. When will my PDF copies be emailed? If you ordered PDF copies of ID cards and certificates, they will be emailed the same afternoon your order actually ships from our offices. This is typically within 1 - 3 business days. If you have received a shipping confirmation email, then your PDF copies have been emailed, as well, in a separate email. 2. How can I get my stuff very quickly? Expedited processing: This service may be selected when completing a registration kit or during the checkout process. What that means is, if you place your order before 10:00 AM Mountain Time, Monday - Friday (except holidays when our offices are closed) and select Expedited Processing, we'll have your order boxed, labeled, and shipped via USPS Priority Mail that same day! Orders that come in after 10:00 AM will get the same white glove treatment the next business day. It usually takes 2 - 3 days for Priority Mail packages to be delivered anywhere in the USA. The cost for this expedited processing service is $14.95. USPS Express Mail shipping: If expedited processing isn't quick enough on its own, you may also select Express Mail as the shipping option during checkout to have your order shipped via USPS Express Mail. USPS guarantees your package will be delivered in 1 -2 business days. "Guaranteed" simply means that if they make a mess of the delivery and it is NOT delivered in 1 - 2 days, you'll get a refund for the shipping cost. Shipping costs range between $29.95 - $38.95. NOTE: During the week of Christmas, USPS doesn't offer the 1 - 2 business day guarantee, due to the heavy influx of packages. 3. Can I order now and send a photo later? Absolutely. Many clients order from their computer, but the image they wish to use is on their cell phone - or they want to take a new picture before uploading or sending the image. In cases like this, it's simple to email us the image: photos@nsarco.com. Please make sure to include your order number. 4. How do I send in a photo of my animal? It's easy to send us an image of your animal. When you've placed your order, you'll land on a confirmation page that will have a place for you to upload a picture right from your computer or cell phone. 5. Do cats qualify as service dogs? Unfortunately, no, although cats can qualify as emotional support animals if you have a prescription letter from a therapist or medical doctor. Emotional support animals can fly in the cabin of an aircraft and can live in "no pets" apartments, but they don't share the other legal rights as service dogs and cannot be taken everywhere service dogs are allowed. In 2011, federal law (the Americans with Disabilities Act) designated that the only animals allowed to serve as service dogs are any breed of dog, and in some cases, miniature horses. Yes, and we've been helping animals help people since 1995! One thing you should know: There is no government-sanctioned registration agency. This is because registration or certification of service dogs and emotional support animals is NOT required by law. That means that anyone can offer registration services online - and there are a growing number of companies that do. These companies, however, are not created equal. Knowledgeable NSAR experts will answer the telephone (during business hours), quickly respond to emails, and be available to answer questions on live chat. Other online companies either have no number to call or sporadically answer the telephone. If you aren't sure about NSAR, you should call us - then call other online companies you may be considering to make sure they answer the telephone, and if they do, that they are knowledgeable. This is very important. 7. 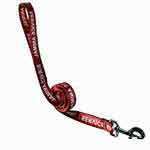 What may a business ask me about my service dog? Is this dog your service dog? What is your dog trained to do for you? 8. 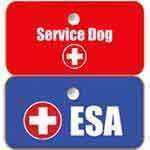 What is the difference between a service dog and an ESA? A service dog is any dog that is individually trained to do work or perform tasks for the benefit of an individual with a disability, including a physical, sensory, psychiatric, intellectual, or other mental disability. 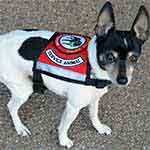 Other species of animals, whether wild or domestic, trained or untrained, are not considered service dogs. An emotional support animal (ESA) is a pet that provides companionship to a person who suffers from symptoms of a mental or emotional disability. ESA's are considered "treatment" for Nearly all domestic pets qualify. 9. What legal rights do my ESA and I have? 10. What legal rights do my service dog and I have? 11. What exactly is registration and what does it do for me? 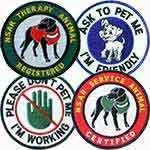 Registration is a way to formally legitimize your service dog, emotional support animal (ESA), or therapy animal. This enables anyone to verify you and your animal as registered and legitimate on our online national database. 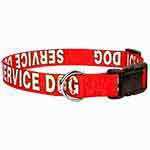 Federal law doesn't require your service dog or emotional support animal to wear any special apparel or ID tags. But without some of these on your animal, confrontation and refusal by store employees, restaurants, security personnel, park rangers, etc. will be the norm - not the exception. And NO one needs that! For some reason, if employees don't see these identifying items on your service dog or ESA, they automatically assume your animal is just a pet, and it's often difficult for them to think beyond that. Good luck trying to convince the young, untrained employee or mall security person that your service dog or ESA is NOT a pet. NSAR will help you minimize these embarrassing confrontations and rejections by offering you official registered ID cards, service vests with patches, service leashes, and service collars. These accessories work! 12. Is registration required by law? Registration isn't a legal requirement, but it has been made very clear that nearly all embarrassing confrontations and hassles are eliminated when you register your animal and make sure it looks like a legitimate service or emotional support animal. 13. May I register more than one handler on a registration? Sorry, but each registration must list only a single handler. 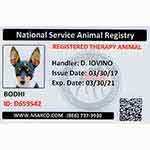 If more than one person uses the animal as a service dog or emotional support animal (ESA), each will need his or her own registration and ID cards. 14. How many ESA's may I register? Is there a legal limit? Federal law has placed no restriction on the number of ESA's a person may have. Common sense dictates that property managers and airline companies will limit how many ESA's may live or travel with you, however. 15. How do I qualify for a service dog? 16. Do you offer express shipping? Yes! You may select Express Mail as the shipping option during checkout to have your order shipped via USPS Express Mail. USPS guarantees your package will be delivered in 1 -2 business days. "Guaranteed" simply means that if they make a mess of the delivery and it is NOT delivered in 1 - 2 days, you'll get a refund for the shipping cost. Shipping costs range between $29.95 - $38.95. NOTE: During the week of Christmas, USPS doesn't offer the 1 - 2 business day guarantee, due to the heavy influx of packages. 17. How long does it take to get my stuff after ordering? By default, we ship our packages via USPS Priority Mail. We ship nearly 150 orders every single day, and on average, the orders we ship out take 2 - 3 business days to be delivered. 18. May I take my emotional support animal with me anywhere? Although an ESA may fly with you (its disabled handler) in the cabin of the aircraft with no fee - and property managers must make a reasonable accommodation for you and your ESA (even when the property is a "no pets" residence), those are the ONLY legal protections afforded to ESA's. No other public or private entity (motels, restaurants, stores, trains, taxis, busses, theatres, parks, beaches, libraries, zoos, etc.) is required to allow your ESA to accompany you. Except for airlines and housing, your ESA has no more rights than a pet. That means they aren't protected by law to accompany you into any public place that does not allow pets. That doesn't mean these places won't let you, it just means that they are not required to, by law. 19. What do I need in order to fly with my animal? If you travel with a service dog, you'll need to be able to explain how your service dog assists you (that is, what task your dog is trained to perform for you) to the airline and/or Homeland Security personnel. If you're not sure how to answer, let us know or call us (866) 737-3930 and we'll help you prepare for that! If you travel with an emotional support animal (ESA), all airline companies will require you to produce a letter from a licensed therapist or medical physician that prescribes an ESA for an emotional disability. Some airlines will also require your therapist or physician to complete a short form that verifies your emotional disability. Click here to obtain a legitimate prescription letter. The same applies to an attached photo ID card identifying your animal as a service dog or ESA (from a credible agency like National Service Animal Registry). Some airlines not only strongly recommend that you have ID cards, a service vest with patches, and a service leash, but all USA-based airlines now recognize and formally recommend using National Service Animal Registry. * When you have an official and documented service dog or ESA, the airlines are NOT allowed to charge you additional fees when your service dog accompanies you in the cabin of the aircraft. 20. Can my family doctor write a prescription letter for my ESA? In a word, yes. Unfortunately, many physician's letters are denied because they aren't written properly. That's because a medical doctor isn't a mental health professional, nor do they know what property managers and airlines may legally require in a prescription letter.